The first nine days of the Tour de France were gripping and exciting stuff. As long as you weren’t one of the riders carted off to hospital with a broken bone, the Tour was fantastic entertainment. 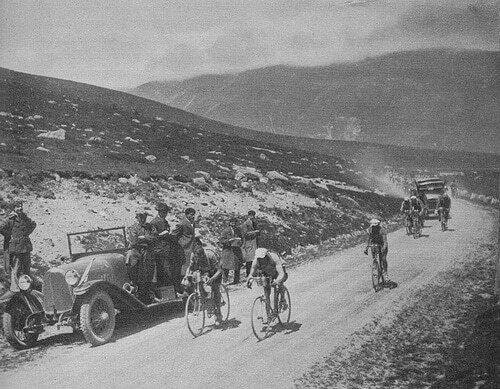 The Tour organisers were probably feeling pretty pleased with themselves for creating nine stages of great interest and unpredictability. The Tour looked to be poised on a knife edge, with the Fab Four (expanding to the Fab Five or Six as we really got carried away) eyeing each other up over the tiniest of second margins. After 2014’s disappointing disappearance of two big contenders (Froome and Contador) this looked a mouth watering tour. But, in the time taken to climb the last 14km of today, the Fab Four had rapidly disintegrated into the Boom Boom Froome show. To say Sky were going to ride defensively, it was a masterclass in blowing your opposition into the waters. There was little crumb of comfort for any of his opposition. Quintana did his best and limited his losses to fight another day, but he still had to suffer the ignominy of getting nabbed on the line, by a Sky super-domestique (Porte). The problem with cycling fans, is that we can be hard to please. We like great cyclists (but we only really appreciate them when they have retired). The ideal winner is not one who wins by a canter, but the plucky loser who finally overcomes years of second places to win by a very small margin – snatching victory in the final stage on the Champs Elysees by 8 seconds would do just fine. When a rider is so dominant it makes the Fab Four look more like 3rd cat road riders trying to mix it at the world champs, it takes the fun and excitement out of the Tour. Yes, we like people to win, but could you not win by a little less? Recently, I was reading the history of British Cycling – legendary tales of riders funding their 3rd class steamer ticket to the World Championships – sharing one skinny British Cycling skinsuit between five riders – without so much time as to wash the rock hard chamois in between rides. Those were the days of the plucky British losers. Smashed out of the park by all those continental riders and their effortless superiority. Who would thought the tables would be turned? With the tour no longer on a knife edge, we half-heartedly say – now there’s no need to sit in and watch the tour; we can go out on the bike and do some training instead. But, we know we won’t – the tour has too much pull. We would watch the Tour de France, even if the yellow jersey had a two hour advantage like the early days of the Tour. And who knows, it has happened before. Perhaps Sky will crack and Quintana will come stronger in the third week. And perhaps Team Sky will go green and travel by public transport. For one tantalising moment Froome climbed out of the saddle and actually looked graceful. Is there such a thing as a dancing and deportment coach for racing cyclists? Sky [or Froome himself] could easily afford one. Yes, I suppose for top cyclists, nit-picking like that is a back handed compliment. But, I feel fully justified in doing it, because I’m one of the few cyclists more spindly than Froome!